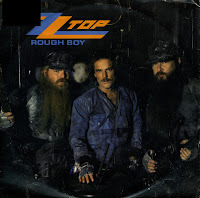 At the beginning of 1985, ZZ Top visited the Dutch top 40 with three singles: 'Legs', 'Gimme all your lovin'' and 'Sharp dressed man'. I thought all three singles, plus the accompanying videos, were all extremely irritating. It was interesting, therefore, to find out that they released a ballad on their new album 'Afterburner' that year. The single came with a rather futuristic video that was a departure from the 'leggy women with hot cars' videos that irritated the hell out of me. Unlike the other singles, this one was very hard to find, and so I only bought my copy in 1991.